With the passage of LB176, introduced by Ogallala Sen. Ken Schilz last session, a person who owns, leases or holds a legal interest in a swine production operation can enter into a contract to produce swine for a meatpacking company. The producer, or contract grower, will own the land, while facilities used to raise the livestock and the meatpacking company will own the swine. The bill ensures a producer’s right to cancel a contract with a packer and allows the state Department of Agriculture to adopt contract regulations to protect producers from coercion and unfair business practices. Contracts between growers and packers may not contain confidentiality clauses that would prevent growers from sharing the details of the contract with others. Schilz filed a motion to invoke cloture, or cease debate and vote on the bill, which prevailed 34-14. Thirty-three votes were needed. LB176 passed on a 34-14 vote. The committee also considered legislation that clarifies a provision regarding the distribution of assets if a grain warehouse fails. Introduced by Sen. Jerry Johnson of Wahoo, LB730 clarifies a rule under which a person who recently has sold grain to a warehouse may regain his or her status as an owner eligible for distribution of assets if the Public Service Commission takes control of the warehouse. Warehouses are required to post bonds for the benefit of those who own or store grain there in the event the warehouse fails. If that happens, only qualified owners are eligible for the distribution of assets. An exception in current law provides that the grain seller may revert to the status of owner if he or she holds a check in payment issued within five days of the date the commission takes control of the warehouse. LB730 clarifies that the exception applies to the date of the sale and transfer of title regardless of whether the warehouse issued the seller a check. Lawmakers also considered a legislative resolution proposing a constitutional amendment that would have guaranteed Nebraskans the right to farm and ranch. 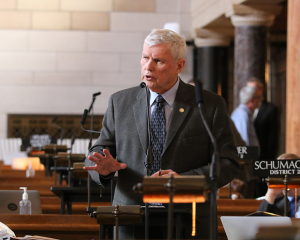 Sponsored by Sen. John Kuehn of Heartwell, LR378CA offered a constitutional amendment that would have prohibited the Legislature from passing laws that restrict the rights of Nebraskans to use agricultural technology and ranching practices without a compelling state interest. The resolution would have placed the amendment on the November 2016 general election ballot. Citing opponents’ legal concerns about the amendment’s language, Kuehn filed a motion to bracket the bill until April 20, the last day of the session. Senators accepted his motion with no objections. A bill that would have created a financing program intended to increase underserved Nebraskans’ access to fresh fruits and vegetables and other healthful food failed to advance from committee this session. LB945, introduced by Lincoln Sen. Matt Hansen, would have provided $150,000 to the program for fiscal year 2016-17 and again for FY2017-18. The bill called for the state Department of Economic Development to contract with community development entities, which would have awarded grants for eligible projects such as grocery store renovations and the creation of farmers’ markets, food cooperatives and community gardens.